About two weeks ago, I finally decided to try out Pandora. I know I'm coming late to this game, but until recently I've had no trouble filling my listening time with podcasts, new purchased music, and the occasional re-listening to my collection. A few things led me to reconsider: 1. I'm starting to realize there is so much music out there I've never even heard of, and 2. I'm kind of getting tired of my "All Pop/Folk/Jazz" iPod playlist, which is kind of incredible considering it has 13.6 days of music (my classical collection has 11 days, but gets much less traffic for various reasons). Though I enjoy getting to know new music even if I don't like it, I'd rather encounter music I love, so I thought I'd try out Pandora's "magic" formula for playing music I should like. My feeling so far: Pandora works. After a few hours of listening and refining a playlist, I do have to say it's somewhat freaky how I can input just a few artists I like and Pandora magically produces other artists or songs I already know I like. I have yet to discover a new act I really love, but I have faith in this method that it will happen eventually. I'm enjoying what I'm hearing, and it's more a surprise than my iPod on shuffle. What is Pandora's magic method? Instead of traditional gatekeepers (critics, DJs, your friends, "the crowd", or even computer programs), they use music vocabulary! 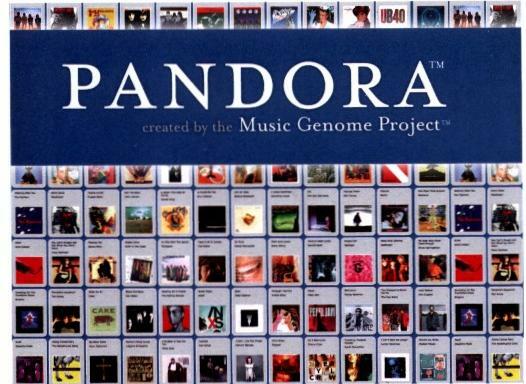 Musicologists listen to Pandora's song catalog and come up with a song's "musical genome," which is a list of musical descriptors or metadata (for more information, read this 2009 New York Times Magazine article). Then, as you rate the songs you hear, the program looks for songs that have similar music descriptors to the songs you like. Some of these descriptors surprise me (who wants to say they like "extensive vamping"? ), but mostly, they make sense. My new advice for those trying to learn music vocab: listen to Pandora, and click on the "Why did you pick this?" button. Maybe I'll try this next time I teach a music class. If everyone talking about music started to use Pandora-like vocabulary to describe a song, wouldn't that be great? I think so. We wouldn't be confined to the vague comparisons to other musical groups that usually constitute our musical descriptions. But Pandora is not perfect. Supposedly, according to it, I'm supposed to like Coldplay, which (with few exceptions), I don't. I'm only a few weeks in, however, so maybe that problem will correct itself. Or maybe their algorithm will get better. Also, Pandora's selection methods by definition don't really get you out of your musical comfort zone, which can be problematic. But I have other methods for that. Also, I'm not sure that Pandora's business model is sustainable. It's very likely that someone will come up with a program that can do the musicologist's categorizing job for them, and Pandora won't be the company to develop it. Also, categorizing music with people is expensive (though I'm happy someone is employing musicologists), and despite their wide user-base, Pandora has yet to be profitable. It seems that many people want their music for free, which is a problem that all aspects of the music industry are grappling with. Have any of you used Pandora, and do you like it? If you do, what are your musical descriptors? I work at a large research university music library, and one of my responsibilities is processing new books, about 100 per month. I don't have time to read the vast majority of those books, but I've started keeping a list of what books I'd read if I had the time. Many of these are academic books, meaning they are too expensive unless you are professionally invested, but that's what libraries are for, right? Beyond ‘Innocence’: Amis Aboriginal Song in Taiwan as an Ecosystem, by Shzr Ee Tan - Did you know that there is a group of native Taiwanese, cultural and ethnically different than the Chinese population, and they have their own music? Ukulele Heroes: The Golden Age, by Ian Whitcomb - Not particularly scholarly, but if you are interested in learning about how the ukelele developed (like how it might have come to Hawaii through Portugal), than this is the book for you. 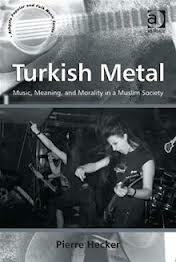 Turkish Metal, by Pierre Heckerl (right) - There are female Muslim rockers? Yes, there are. The Last Biwa Singer: A Blind Musician in History, Imagination, and Performance by Hugh Ferranti - Looks at the tradition of blind musicians in Japan, especially Yamashika Yoshiyuki (1901-1996). It’s amazing how many cultures revered blind, itinerant musicians. The Irish had a long tradition of blind harpers and fiddlers, too. In Search of Song: The Life and Times of Lucy Broadwood by Dorothy De Val - living in England at the beginning of the 20th century, Broadwood was instrumental in the folk music revival. She went around with many people (including one of my favorites, Percy Grainger) collecting English folk songs on wax cylinders before the music disappeared. The Music of Fantasy Cinema edited by Janet K. Halfyard - This book is an intersection of music and one of my other interests/hobbies, science fiction and fantasy. It's collection of essays about fantastical film music, including Jim Henson’s Labyrinth, Legend, and Edward Scissorhands. The Accordion in the Americas: Klezmer, Polka, Tango, Zydeco, and More! ed. by Helena Simonett - A bunch of essays about a very well-used and versatile instrument. Shpil: The Art of Playing Klezmer, ed. by Yale Strom - a collection of essays on how to play Klezmer music, with sections on each major instrument. I wish I had had this book when I started my own Klezmer band! Alice Cooper: Welcome to my Nightmare by Dave Thompson - Haven’t you always wanted to know about the real-person Born-Again-Christian golfer that spawned the famous Rock alter-ego? Music as Intangible Cultural Heritage: Policy, Ideology, and Practice in the Preservation of East Asian Traditions, ed. by Keith Howard - How does music become a politically protected cultural heritage, and does that actually change the music and the function of the music? I guess I can deduce from this list that I'm interested folk music, the cultural power of music, and uncommon instruments. Any of those books sound interesting (or uninteresting) to you? Are there any music books you wish you had time to read? "The music is juvenile stuff—tonic-dominant, without harmonic richness or surprise. Listen to any score by Richard Rodgers or Leonard Bernstein or Fritz Loewe if you want to hear genuine melodic invention. I was so upset by the banality of the music that I felt like hiring a hall and staging a nationalist rally. “My fellow-countrymen, we are the people of Jerome Kern and Irving Berlin! Cole Porter and George Gershwin, Frank Loesser and Burton Lane! We taught the world what popular melody was! What rhythmic inventiveness was! Let us unite to overthrow the banality of these French hacks!” (And the British hacks, too, for that matter.)" While I could talk a lot about his imagined American musical nationalism, in the interest of space, I'll concentrate on just two phrases: "harmonic richness" and "melodic invention." In order to talk about Denby's ideas of harmonic richness, we need to unpackage "tonic-dominant." These hyphenated words refer to the most commonly understood and practiced concept of western harmony. Tonic is defined as the home triad (a chord made up of three notes), also called the I-chord. It's the harmony that that music continually returns to at the end of a phrase (called a cadence) or song. On the other hand, dominant (also called the V-chord) is a triad built on the fifth degree of the scale. The dominant chord usually immediately precedes the tonic, and it used to build up tension so that when we return to the tonic chord, we feel like the music has been somewhere. For an audio example, think of the ending of almost any Mozart or Beethoven piece; they almost always end a work by alternating between the tonic and dominant several times before finally arriving at the final tonic. Now, melodies can travel through almost an infinite number of other harmonies besides the dominant (the subdominant (IV), supertonic (ii), and submediant (vi) to name a few), but really most music only needs two chords for feeling of harmonic motion: the tonic and the dominant. Denby's argument is that Claude-Michel Schönberg is a "hack" because he doesn't really venture beyond the basic two chords, the I and the V, in his music. First of all, Denby is wrong about the music of Les Mis being only or even predominantly tonic-dominant. While Schönberg's music may lack some of the extra-note jazz inflections of American musicals of the mid 20th-century mentioned in his article, Les Mis's music is as not as simple as he makes it out to be. Many of the songs in Les Mis focus especially on the subdominant (IV) chord, among many others. Secondly, if tonic-dominant and harmonic richness is the only thing that makes music wonderful, then we can throw out a LOT of music. Much of Mozart's work, for example. The one Les Mis song that could definitely be characterized as tonic-dominant (though it has a strong movement to the submediant (vi), or relative minor, at one point), is "Do you hear the people sing?" This song totally makes sense stylistically as a tonic-dominant song. Its style and mood is a moderate rousing military march, meant to be easily remembered and marched to. Military marches are traditionally mainly tonic-dominant, and I think Schönberg hit the nail on the head writing this song they way he did. By the way, later in the article, Denby mentions Verdi's opera Rigaletto as an "antidote" to Les Mis. The most famous song from Rigaletto is "La donna è mobile," a song that is about as tonic-dominant as they get. In fact, until later in life, Verdi was not known as a harmonic innovator as much as a composer of memorable melodies, many of which are still in public consciousness one hundred and fifty years later. And that's exactly what makes Les Mis so memorable today: the melodies. Denby does not elaborate what he means by "melodic invention," which apparently he thinks Les Mis lacks (it might be connected to "harmonic richness" or "rhythmic inventiveness" in his mind), but I would argue that if anything is working in the music of Les Mis, it's the melodies. I certainly have the music stuck in my head, and may have had them there since the 1980s, when the musical first came out. These melodies have varied moods and emotional states from the raunchy "Master of the House" to the plaintive "Bring Him Home" to the hysterical "At the End of the Day." I'm not saying Schöberg's music is perfect, but it certainly is memorable and he does a wonderful job of weaving the themes in and out of the full score, something that few modern musical composers besides Sondheim do well. And memorably orchestrated, I would add. Music does not have to be "harmonically interesting"(whatever that means for Denby) or have a lot of different chords to be memorable, poignant, and useful, and I think the music of Les Mis proves that. As for harmonic surprise, well, there are other types of surprises that can delight, too. Do you hear the people sing? 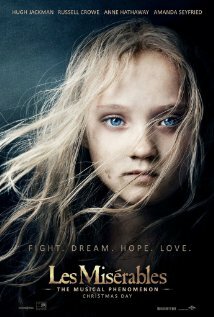 Singing the songs of this Les Mis? It is the music of a people who like it. Because there are lots of people to whom this music means a lot. I hope Denby the Dandy realizes he's asserting an oppressive bourgeois perspective, which is exactly what the French in Les Misérables were revolting against. But I guess that's what the New Yorker is all about. Or maybe Denby just picked the wrong music vocabulary for what he wanted to say? So let that be a lesson to you: don't use "tonic-dominant" unless you really mean it. *When first posted, I stated the article was by David Danby, when it was in fact David Denby. I apologize for my mistake. It's time for Noteworthy Instruments, where I talk about musical instruments that aren't your normal western orchestral fare. While I like the traditional clarinet, viola, electric guitar, and glockenspiel, there are lots of other instruments that deserve attention. In October, I wrote about the shamisen (if you didn't watch the Yoshida Brothers video, you really missed out). This week's treasure: the hurdy-gurdy. The hurdy-gurdy is about a thousand years old. Also called a wheel fiddle, the player produces sound by turning a crank which rubs a wheel against the strings. A hurdy-gurdy has several strings, a couple of which are drones, making this instrument sound a lot like bagpipes. It's amazing how many old instruments in many traditions have drones. Watch the talk! As an added bonus, she sings a song in Basque. Here's another playing demonstration with a different hurdy-gurdy; there's no standard way to construct them (for more detailed info on the hurdy-gurdy, see wikipedia). I love how the comments below the video are in three different languages. So for those of you who watched the academy awards that year and wondered "what the heck is that unusual-but-awesome instrument? 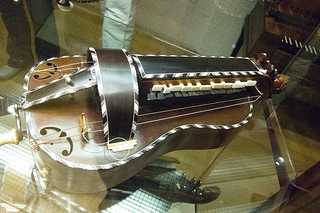 ", which I'm sure is what most people were thinking, now you know—the hurdy-gurdy. Next week, I'm going to tackle the music of Les Mis.